There is an almost universal belief by farmers that high land prices are beneficial to farming. I contend that high land prices are a curse on farming. I do not deny that some landowning farmers become very rich from high prices, but only when they sell, most of them making more money from selling their farms than they did throughout the time they were farming. There is a clear distinction between what is beneficial to a few farmers and what might be beneficial to farming in general and especially to those who want to farm but have no land. In Scotland the average price of farmland is more than £4000 per acre and has increased by 17% in the last year. The average price of arable land is £8000 per acre. The market price of land is much more than can be justified by its productive capacity. Taking as an example land for growing wheat which is capable of yielding 3 tonnes per acre:- the current price of wheat ex farm is less than £120 per tonne which gives a gross income of under £360 per acre, the current cost of growing wheat is about £115 per tonne or £345 per acre, leaving a surplus of £15 per acre. With arable land at £8000 per acre and the cost of borrowing at about 4%, the annual interest cost is £320 per acre, clearly unaffordable at current wheat prices. The price of wheat would need consistently to be £250 per tonne to justify a purchase price for arable land of £8,000 per acre. The traditional method for estimating the price of a farm which would enable the purchaser to fund a mortgage and to make a living from the farm puts the price of a farm at 20 times its rent. This was the basis of the price we paid for our farm in 1992. It was also the basis for the price we paid for the first piece of farmland we bought in 1975. The RICS (Royal Institute of Chartered Surveyors) Land Market Survey (2015) states that the average rent of arable land is £85 per acre which means its purchase price should be £1700 per acre. The current acreage price of £8000 is 4.7 times more expensive than its productive capacity would justify and its rent would be £400 per acre. If The Absolute Right to Buy is introduced, tenants could not exercise the Right to Buy because the freehold price is too high. The introduction of LVR will end speculative investment in farmland. Farmers who currently try to maximise their riches by maximising the area of land they own will minimise the area they own to maximise profits and minimise the amount of LVR they have to pay. This will increase the area of land available to be farmed by newcomers to farming who currently cannot afford to acquire land. There are several farms in our neighbourhood which were owner-occupied when we moved to Fife in 1992. They are now part of larger farm businesses, some have been bought and the rest are farmed under contract. Conventional wisdom says that these smaller farms had to be taken over because their size was insufficient for them to be financially viable. The following description of one of the farms shows that this statement is untrue. The farm has 185 acres with a good farmhouse. The farmer grew wheat and potatoes and kept cattle and sheep. He had inherited the farm from his father and I believe that he had no debt. It appeared that sufficient profit was made to afford a comfortable living. It was financially viable as an independent farm but ceased to be so when it was bought by a large farm business because its price was £1.2 million. Its price based on the 20 x rent formula would have been £314,500. It is their high market price which makes many smaller farms unviable, not their lack of potential to provide a living for a family. There are no official statistics of the number of farm holdings which are farmed by large farm businesses but the number and size of holdings in Scotland is worthy of attention. There are 52,740 holdings with an average size of 261 acres; 8% have an average of 2,350 acres and account for 76% of the total farmland area; 40% have an average of 146 acres and account for 22.2% of the area and 52% have an average of 8.3 acres and occupy 1.6% of the farmland area. Many but not all of the smaller farms are farmed part- time but there is scope for their number to increase when LVR is introduced and land becomes available from existing larger farms. A comparison with countries in the rest of Europe shows that the structure of farming in Scotland is exceptional. The average size of farms in the EU27 is 54 acres and farms between 86 and 135 acres are classified as Big. Medium sized farms have between 50 and 86 acres and Small farms between 17 and 50 acres. The average farm size in Scotland is almost five times that in the EU27. Within the UK it is more than twice the average in England and two and a half times that in Wales and Northern Ireland. There is scope for there to be many more farms and independent farmers in Scotland. The number of people employed in farming continues to decline. Between 2004 and 2014 the regular workforce has fallen from 63,832 to 59,636, a drop of 4,196. The data from our farm indicate why this is happening. We employ two full-time staff and each has an annual gross income of about £31,000. Their take –home pay is £20,500 and we send £10,500 for each to HMRC every year. In other words, we employ two staff and send the take- home pay for another to the government! There is no shortage of work to be done on farms and the abolition of income taxes following the introduction of LVR will allow more people to be employed. Not only will the cash costs be reduced but also the costs of stress associated with complying with the outdated and complicated employment tax laws. Think of the relief and the ability to concentrate on the job of farming! We should try to become reasonably rich by farming the land, not trying to become unreasonably rich by owning as much land as possible to maximise our ability to capture the unearned increase in its market price. The example of Hong Kong is worthy of study. 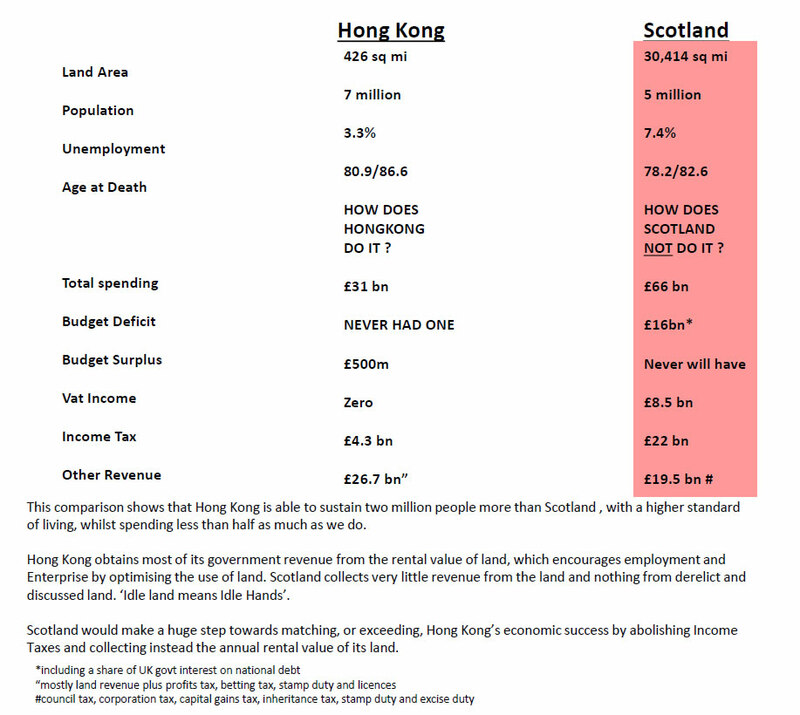 This comparison should make every person in Scotland ashamed to see how far behind we are. That barren rock has to import all its food, fuel and raw materials with 2 million more people having a higher standard of living than those of Scotland, which has seven times more land and is rich in natural resources. 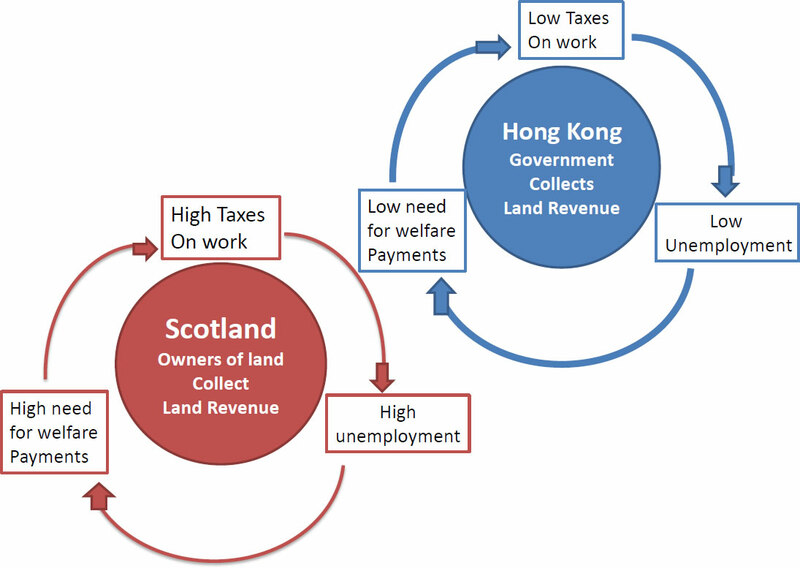 My last slide shows what Scotland could do by adopting, and improving on, the economic policy of Hong Kong. May I draw your attention to the person responsible for this. She is my ten year old granddaughter and another reason for wanting to pay the rental value of my land to the government. I support the case for radical land and tax reform to end the immoral accumulation of national debt which will be left to be paid by future generations. There is now an opportunity stop pretending that a promise to pursue the failed tax policies of the past, but to pursue them better, will lead to the level of prosperity which our country has the potential to achieve. Thanks for clarifying. I tend to argue tax = burden = discouragement thus taxing wages and profits is illogical as it discourages behaviour beneficial to our society/economy. Whereas taxing land value is logical as it discourages not using it = encourages using it. Anyway, I can see some would prefer Land Value Revenue.